Your Costa Rica vacation is off to an incredible start, and you are sprawled out in a giant hammock that criss-crosses the catamaran’s massive hulls. The waves have lulled you into a state of relaxation bordering on meditation. Suddenly, in the distance, a spray of water explodes from the ocean’s surface. You (and the rest of the boat) spring to attention, eyes squinted against the golden sun. Focus, focus… yes! You’ve spotted the telltale mottled skin and white flippers of a humpback whale. The captain maneuvers the boat for a closer look at the majestic sea creature. Costa Rica is home to an estimated 25 whale and dolphin species, which migrate, mate, and make their homes in the Pacific Ocean and Caribbean Sea. Various dolphin species frolic up and down the Pacific coast, while the Caribbean is home mostly to the bottlenose dolphin. In most areas, dedicated whale watching tours are uncommon, as other excursions – snorkeling, surfing, and scuba trips, among them – often include marine wildlife watching on the itinerary. The southern Pacific, however, is different. Dominical/Uvita and Osa Peninsula are the major stomping grounds of Costa Rica’s whale and dolphin species. The nation’s most iconic and oft-spotted whale, the humpback, spends more than eight months a year in these waters – the longest humpback whale season in the world! So grab your camera and climb aboard; you’re in for the adventure of a lifetime. Costa Rica’s northwestern corner of Guanacaste is known for its dolphins, including spinner, spotted, bottlenose, and common dolphins. However, during the migration season, humpback whales are not an uncommon sight off the coast of Papagayo, Playa del Coco, Tamarindo, and other beaches. Organized dolphin and whale-watching tours are not common, but many ocean tours (sunset sails, snorkeling excursions, and more) often detour to popular marine animal zones, especially during mating and migration season. Best Time to Visit: Animal sightings are common year-round; humpbacks migrate through the region August – October and December – April. Like the north Pacific, the Nicoya Peninsula is not well known for its whale watching. However, sightings of humpback whales, bottlenose dolphins, spinner dolphins, and common dolphins are common throughout most of the year. Whale watching tours are not common, but daily cruises depart from Malpaís, Santa Teresa, and Montezuma to Tortuga Island, snorkeling reefs, and scuba hotspots; these excursions offer the region’s best chances for spotting whales, dolphins, and endangered sea turtles. Manuel Antonio and Quepos are an excellent jumping-off point for whale and dolphin watching. Here, the crystalline Pacific is home to migrating humpback whales, as well as spotted, common, spinner, and bottlenose dolphins. The most spectacular central Pacific whale watching, however, is located just south of Dominical in Ballena National Marine Park. The park’s most popular attraction are its dolphins and whales – pseudo-orca, humpback, and pilot whales, among them – and the park’s iconic “whale’s tail” land formation. Organized dolphin and whale-watching tours depart daily. Best Time to Visit: Most species present year-round; humpback whale migration August – October and December – April. 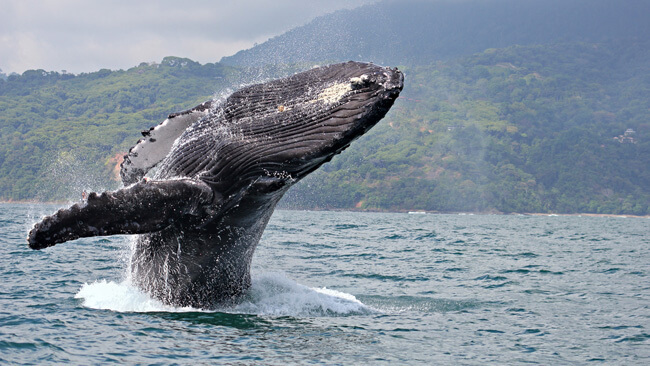 The warm waters off the Southern Pacific’s Osa Peninsula are Costa Rica’s most popular destination for whale watching; in fact, the Osa Peninsula is home to the longest humpback whale watching season in the world! Most tours depart from Drake Bay, although you can catch day excursions from Puerto Jimenez, as well. In addition to humpbacks, you can spot pilot whales and pseudo orca whales, as well as bottlenose dolphins, spinner dolphins, spotted dolphins, common dolphins, and rough-toothed dolphins. Organized dolphin and whale-watching tours depart daily. Best Time to Visit: Most species present year-round; humpback whale migration late July-November and December-March.